Just as people can be challenged to perform better when they are confronted with more demanding expectations, they also are motivated to upgrade performance when they are given a clear sense of direction. The acquirer who steps forth promptly to structure integration goals for employees provides a crucial focus for organizational resources. 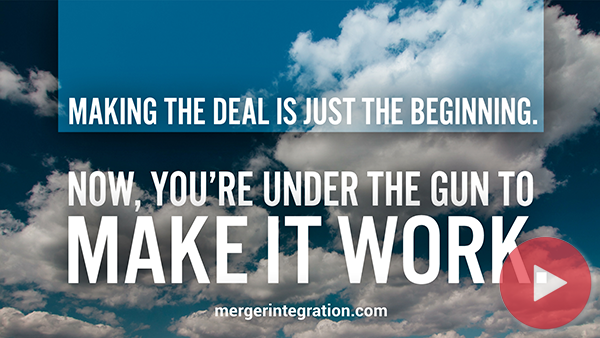 Many of the conventional problems associated with mergers and acquisitions are a direct offshoot of people going off on tangents, operating in a fog, or essentially shifting into neutral for lack of well-defined targets. Newly merged or acquired organizations need road maps with well-charted routes and specific destinations. But it is very common for employees to muddle around for a long time before they finally figure out what is going on and where the integration is headed. It should be clearly communicated to what extent the target company will be integrated. Integration matters more in some types of mergers than others, and it matters more in some functions than others, depending on the rationale behind the deal. At least two months before the deal closes, the integration strategy, processes, and structure should be determined. A variety of additional teams usually organized by function (I.e. sales, human resources, finance, and information technology, etc.) or by business unit, product line, process, or geographic location. Regardless of how the teams are set up, roles and responsibilities should be clearly defined so people can be held accountable. Plus, decision-making protocols and escalation paths should be communicated so integration issues can be resolved quickly. The presentations and tools in this section cover the fundamentals of integration strategy, examples of governance models and integration structure, and typical duties of the integration teams. The documents can be easily customized to explain your integration approach to your teams. Three practices that position your new director group for merger success. Today versus the old days. Companies merge for at least one of three reasons. Anticipate issues that could slow the realization of synergies.